This is a two-part, smooth, silver paste that cures to form a hard, durable polymer that is extremely conductive, both electrically and thermally. It adheres strongly to metals, glass, and well to most plastics used in electronic assemblies.It has a convenient 1-to-1 ratio, and a long 4 hour working time. The 8330S is used as a solder replacement for bonding heat-sensitive electronic components and for making conductive bonds where solder is not an option, such as when bonding to glass, soft metals or plastics. It allows for quick cold soldering repairs of electronic devices, makes excellent thermal connections, provides excellent EMI/RFI shielding, and is very effective at filling in seams between metal plates. 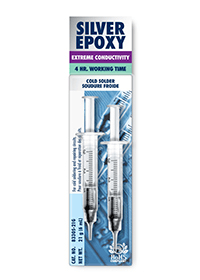 It is useful in applications where the high cure temperatures of 1 part epoxy systems can potentially damage components. Its primary applications are in the assembly of electronic devices.